Tanzania is home to many of the most iconic places in Africa including the world-famous Serengeti with its annual wildebeest migration, as well as the highest mountain in Africa - Mount Kilimanjaro - and of course the Ngorongoro Crater, the world’s largest intact volcanic caldera. © Travel ButlersIf that isn't enough, it is also one of the best places in the world where you can get close up to chimpanzees, or see huge packs of the endangered African wild dog in one of the largest game reserves in Africa. Then add to this a barefoot beach escape on the exotic spice island of Zanzibar and you have a holiday that is brimming with romance, excitement, and a sense of adventure as you explore this remarkable country. Safaris in Tanzania are split into 2 distinct options, and we recommend you do one or the other in one trip, as it is both time consuming and costly to try to combine both in one holiday. The Northern Safari Circuit is the biggest draw for first-time visitors to Tanzania as it passes through some of Tanzania's most famous wildlife National Parks. This loop includes the Serengeti and Ngorongoro Crater as well as the less frequented but very beautiful Tarangire National Park and Lake Manyara National Park. With easy access from the main international Kilimanjaro Airport, which is serviced by airlines such as Kenya Airways, KLM, British Airways, Qatar and Ethiopian, it is no wonder this is so popular. The Great Migration is also synonymous with Tanzania and an incredible sight to behold. The greatest wildlife phenomenon of them all, it's an experience that will leave you completely speechless. As safari experiences go, there's nothing that can touch it and if you're looking for the definitive safari, then look no further. © Travel ButlersMany people choose to have a private 4x4 safari vehicle, with an experienced driver-guide who will be with them throughout their Northern Circuit safari experience. Driving between the different Parks, you will pass through busy rural farming communities, with fruit and curio stalls jostling for space along the roadside. For those who want to avoid the ‘African massages’ that the journeys between destinations on bumpy roads will invariably include, there is the option to do an exclusive fly-in safari either for all or part of the time on the safari circuit. The Southern Safari Circuit is wonderful for wildlife lovers eager to get 'off the beaten game drive'. This circuit is visited far less than the its northern counterpart, though it is just as magnificent and heaving with wildlife. Starting and ending in the bustling city of Dar es Salaam, a safari here is normally characterised by a unique fly-in experience, as the distances are too long to travel by road – so light aircraft is the ideal way of getting around. 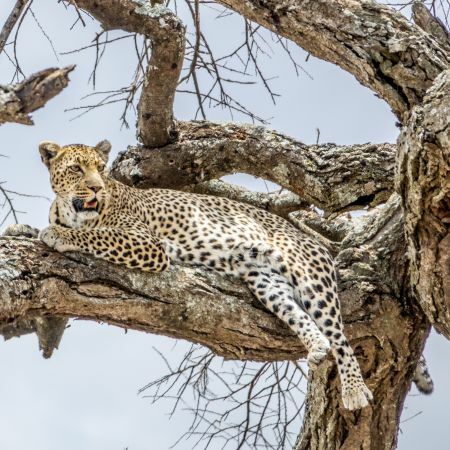 A Southern Safari could include the Selous Game Reserve and the remote Ruaha National Park, and for the intrepid explorer a few nights in the truly isolated Katavi National Park is a safari enthusiasts dream come true. Or journey even further to the Mahale or Gombe National Parks, where wild chimpanzees swing through the forest in the sunlight, offering a truly priviledged experience to get close to these fascinating creatures for an hour. If you are planning a trip to Tanzania below you can see a few of our favourite Tanzania safari and beach holidays for travel in 2019 / 2020 to help get you started. All of the holidays we plan are tailor-made to your exact requirements, so please do give us a call or enquire now via the web site - we'd be delighted to help you! 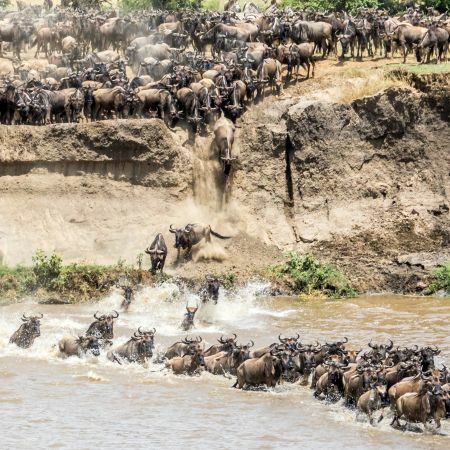 And of course, if seeing the Great Migration is high on your bucket list, we'll also do whatever we can to get you a front row seat for what has been dubbed The Greatest Show on Earth. Although the exact route and timings of the migration change slightly from year to year, it is possible, with some careful planning, to be in the right place at the right time.